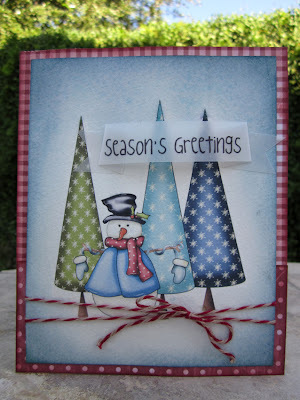 Week 43 - Christmas Card And Add Kraft! We are looking for some extra talent for our International Design Team, so if you'd like to be part of our hugely popular team and live OUTSIDE THE UK then get applying now! 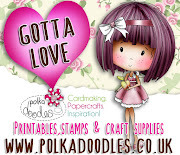 You will need to be familiar with using digistamps as well as using normal stamps as we are primarily a digital company, but we have lots of great things on the go in addition to this blog, so we all always have lots of creative fun at Polkadoodles. The winner from this challenge will receive a copy of the very fab Studio 12 Picknix 2 cd - Gingerbread Twist! Don't forget to follow our rules which are below. Congratulations! Dawn please email Nikky for how to claim your £5 voucher to spend instore - all the blinkies can be found in the sidebar. Please remember to add the verification code and the challenge week in the subject field on your email - you must use the code given above to claim your prize otherwise we cannot release it. Good luck with the challenge - deadline for entries is Sunday 4 November at 12noon GMT. Ruth: I've used a kraft card base, inked the edges (to hide my rubbish cutting!) and added faux stitching around the edges. Sentiment is a stamp from the not yet released Pen and Paper Circle edition 5 (get yours ordered now!) I've made the stocking from my own template and papers from Here Comes Christmas. Ribbon from my stash and not a bit of glitter in sight!! 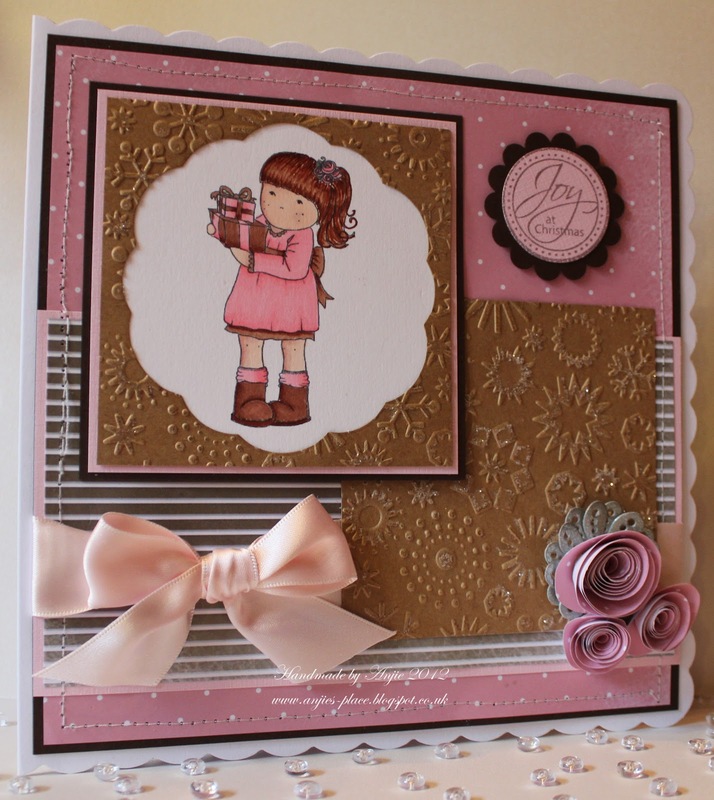 Norine: This was another fun challenge for me....once I get my head around doing what the challenge dictates, lol! I ended up making 2 cards again this week! I really love the clean and simple style of the first one. 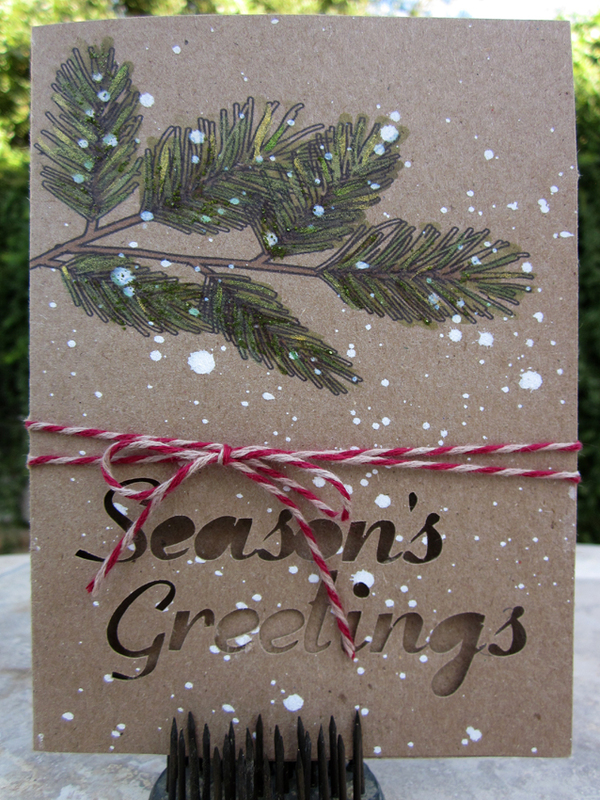 I used a digi stamp from the Gingerbread Twist Picknix cd for the pine bough and then flicked white paint over the whole card front for snow. The Season's Greeting's sentiment is a cut file from the Here Comes Xmas cd that I cut out using my Silhouette. For this card I used images from the Sundae of Season's cd, photo-shopped them all together and then printed it onto 140# water color paper. After printing it, I did a water color wash around the outside edge, being careful not to let the water touch the printed image. 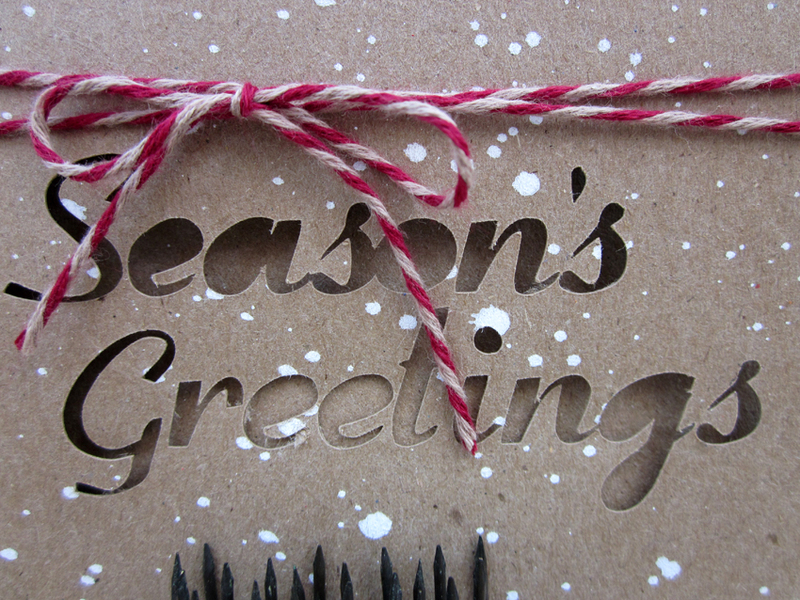 The sentiment is printed onto vellum and banner folded for some dimension. 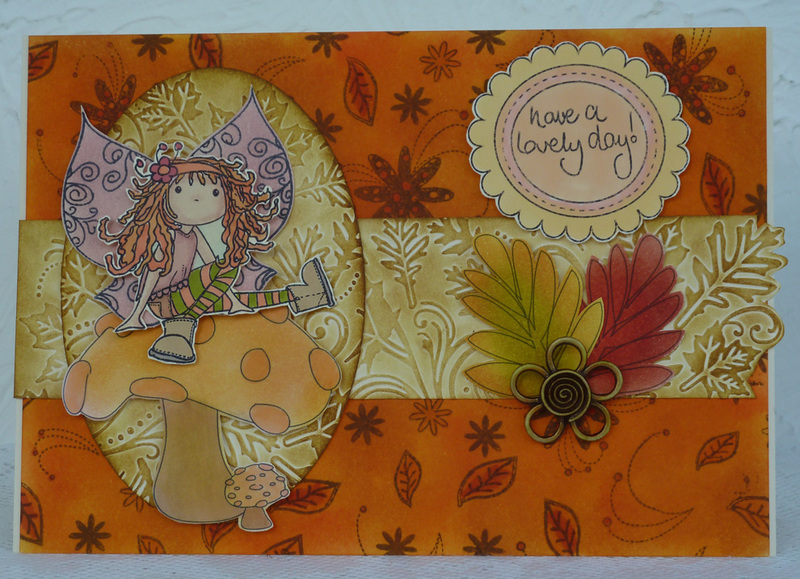 Eva - For this card I used images and design paper from Picknix 2 - Gingerbread Twist. I coloured these in with Pro Markers. I also printed out the letters JOY and some holly from the Pen & Paper 4 CD. I used die cuts for the hearts and added some stick on gems, ribbon and hat pins. Anjie - For my card I've used an image and papers from Pretty Sweet. The image is coloured with ProMarkers. The frame around the image is the waste from Marianne Designer Doily Die, as is the silver flower. Anne - I'll own up now, I tried and failed miserably:( Three times I printed this image onto t-shirt transfer papers and not once did it turn out well enough for me to use. 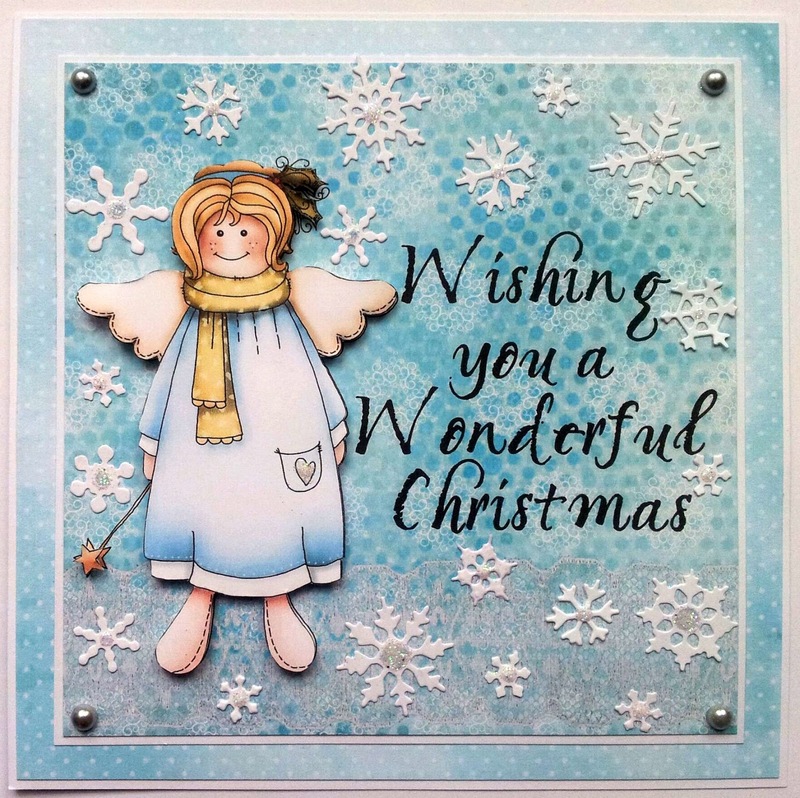 In the end, after many, many swear words and feet stomping among other things I gave in and just made a card using papers from Magical Winter 1 and the image, embellies and sentiment is from Gingerbread Twist. 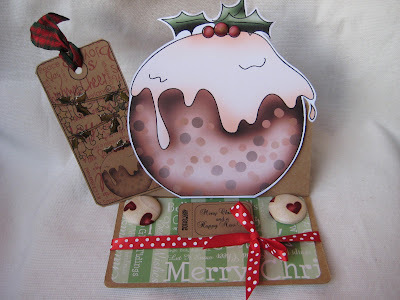 I printed the tag and ticket on kraft cardstock, just added a little glossy accents on holly and berries, then buttons and ribbon as embellies. 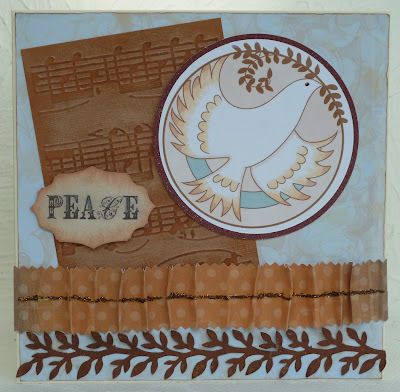 Clare - I have used Kraft card for the base of my make and the images and sentiment are from both Sundae of Seasons and Here Comes Christmas CD's. I have distressed both layer's of my Bazzill card. For the snow on the reindeer and tree's I have used Polar White Flower Soft along with some Diamond Stickles. The wooden snowflake embellishments are by Kar's, the red pearls from Kaiser Craft and finally I have used deckled edge oval Nestabilities. Hi everyone! Well, Autumn is definitely in the air around here, it's been freeeeezing lately and it's time to pull out all those winter woolies and jumpers now I think! I do love this time of year though, with the autumn colours and the swirly leaves, so that's the inspiration for this week's challenge - autumn, autumn, autumn! So get working with those reds, oranges, browns and lots of leaves for your challenge creation this week and show us what you got! There will be 2 winners for this challenge and they will both win a special prize of Nikky's brand new Colour Therapy tutorial DVD PLUS a copy of our fabulous Sundae of Seasons CD which has a wealth of digi stuff for Autumn, Winter and the rest of the year too - it's a great prize worth over £30, and we have 2 to give away! Congratulations to you all as you're all winners of a copy of the fabulous Here Comes Christmas CD! Please all email Nikky for your prize and you can all grab your blinkies from the sidebar. Please remember to put your verification code and the challenge week in the subject field on your email. For all prize winners, you must use the code given above to claim your prize otherwise we cannot release it. Now for some inspiration from the Design team which you'll see is very colourful and sure to warm you up. 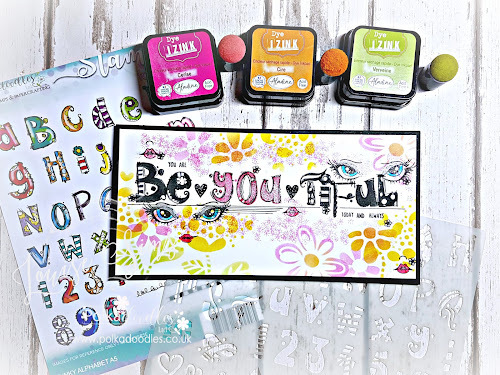 JAN: I love the colour palette that this week's challenge offers and decided to make a word book for my 'Autumn' project using the letters and template from the 'Candy Doodles' CD. The papers are all from various Polkadoodles CDs (see my blog for further details) and all the little embellishments are from the 'Sundae of Seasons' CD. A couple of ribbon ties, some bling and the little 'FUN' pennants are from my stash. 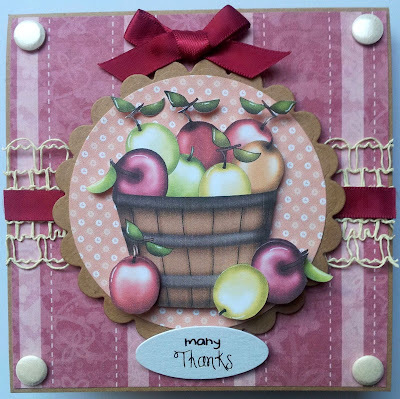 Karen - I used the Sundae of Seasons CD again for my card, and Memory box dies for the swirls. 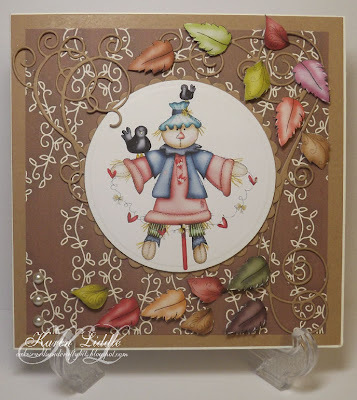 Claire - I too used the Sundae of Seasons CD to create my wall hanging which has been coloured with Distress Inks. Fliss - I'm a little challenged at the moment as my printer is playing up so can only print out black and white until it gets fixed. This inspired me to do my favourite thing, making my own background paper and I used the Daisy Doodles stamp set for this, stamping a cluster of flowers, leaves and swirls with brown ink then inking the panel with Distress Inks. I printed out the mushrooms and some leaves from the Sundae of Seasons CD and stamped Gracie, colouring with Promarkers and Distress inks. I added an embossed border for texture. Full details of how I made the card can be found on my blog. NJ I love autumn colours too. So rich and lovely. I have used the SUNDAE OF SEASONS CD and decorated a gift box using papers, leaves, flowers and a tree. I have also made a matching card. shell - I've used papers from the Studio 12 Picknix Collection 2 - Gingerbread Twist CD with a gorgeous Emma Canning digital image coloured with Copics. Some pleated trim together with pearls and a Tim Holtz die cut clock complete the card. Some fabulous creations here and you have until 12 noon on Sunday 28 October to get your entries in. Please don't forget to check the rules before linking up. Good luck! 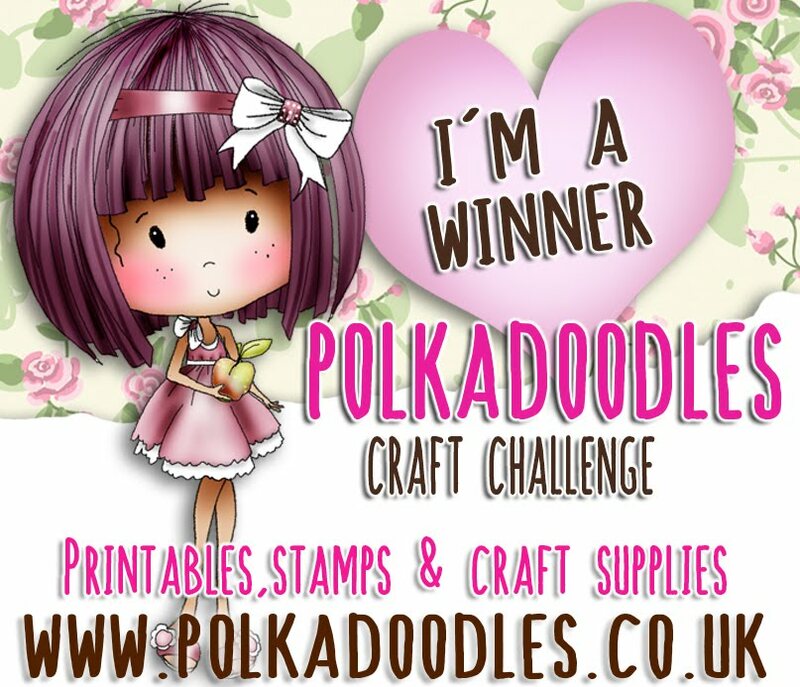 Welcome to another Polkadoodle challenge! We also have a quick heads up for you today - the back orders for the lovely Pen and Paper Circle club kits are now available online so if you missed Issues 2, 3, or 4 and are kicking yourself you can now order here but be mega quick because once they've gone that's it - and there is severely limited stock on these!! Go now! The winner from this challenge will receive a £5 voucher to spend in store! Don't forget to follow our rules which are below! Congratulations to you all! Please email Nikky for your prizes and you can all grab your blinkies from the sidebar. Please remember to put your verification code and the challenge week in the subject field on your email. For all prize winners, you must use the code given above to claim your prize otherwise we cannot release it. The challenge ends on Sunday 21 October at 12noon GMT. Fliss - A spooky scene with a little witch is my inspirational for this week. 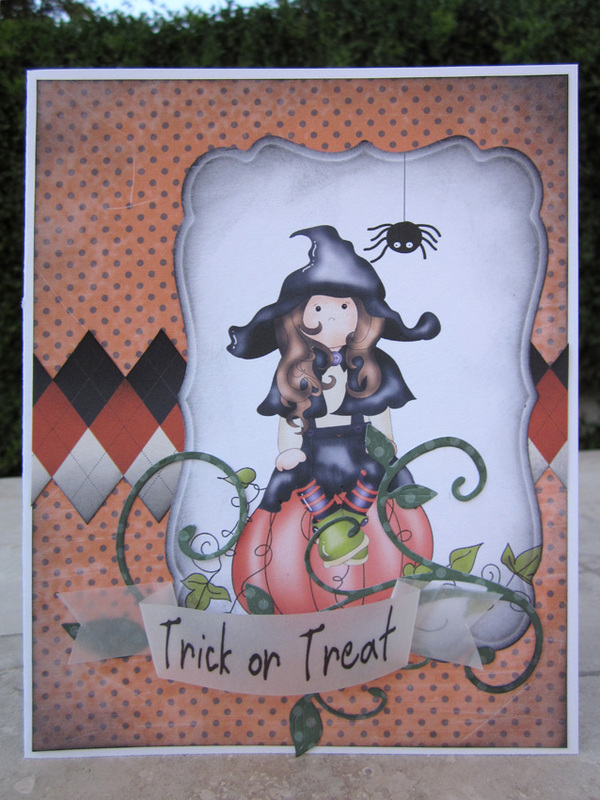 I used paper from the Halloween Doodles download bundle (which is where little Polly witch and the cute spider come from too) and made it into a frame with a shaped die, cut it to fit my card blank and inked the edges. I printed out a haunted house from the Sundae of Seasons CD Autumn section and set this in the frame then added pumpkins from the CD together with Polly and the spider. Anne - Well I'd to improvise this week girls. 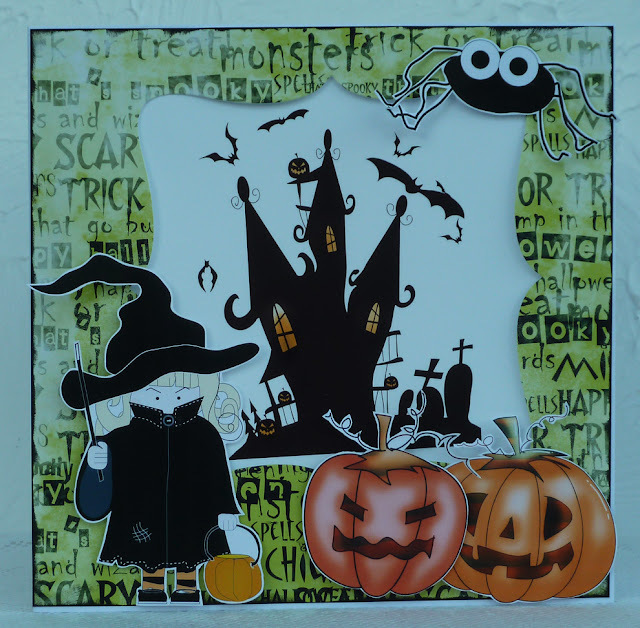 Believe it or not of all the fabby cd's Nikky has sent me there was hardly anything I could use for this theme but I did find this fab little Dracula, pumpkins and papers on the Sundae of Seasons CD so I had a start. Then I remembered the Halloween Doodles download that we got last year so I fired up my proggy and layered them all into together to create a little scene. I then got to work with my polychromos and added the sky and some grass. A few little bits and pieces cut with my cricut and the job was done. Eva - I had an idea for a halloween make. Decided to do something different so I made a scary pumpkin window sill display for my kids. They LOVE Halloween and I normally make their room super spooky. 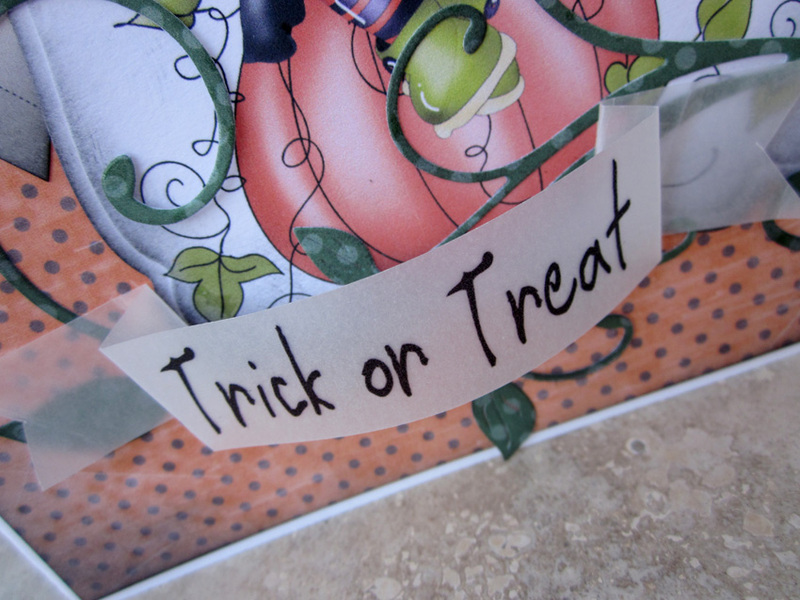 I have used pumpkin images and little bat images from the Sundae of Seasons CD. I coloured the pumpkins in with Pro Markers and added a bit of glitz. I also added a bit of extra sparkle with some stick on gems and pearls. Clare - This is the first time since I started crafting that I have "done" Halloween and I have absolutely loved it, made me feel like a kid again!!!. I enjoyed it so much I have made two different sets of trick or treat party bags and cards. The cute spider paper in set one was from the Polka Doodle Halloween download bundle. The images in both sets and the sentiment is from the Sundae of Seasons CD Autumn section. The cute tangerine & black Puffy Thickers are from American Crafts. 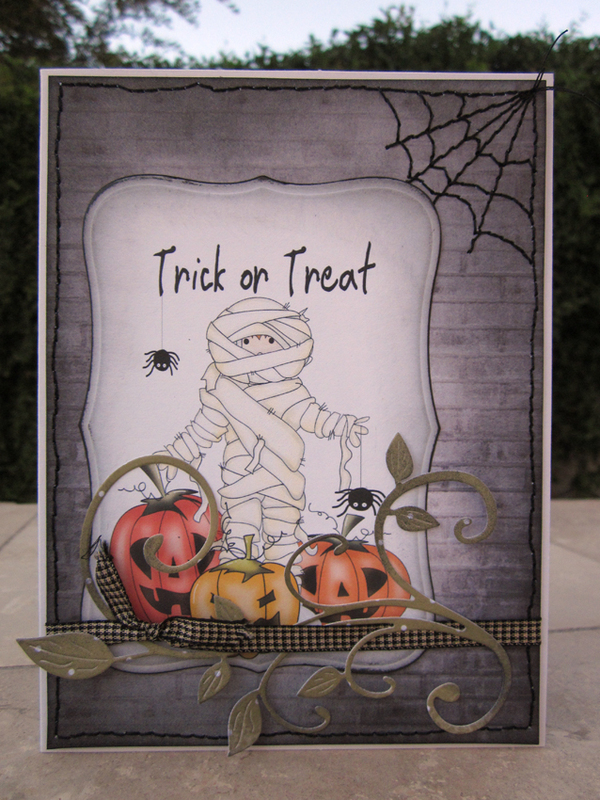 I even managed to recycle the netting from the pumpkin chocolates and used it on the card!!!. Norine - For someone who isn't particularly a Halloween-ish person, I got a little carried away with the CUTE designs on the Sundae of Season's cd and I made TWO cards this week!! 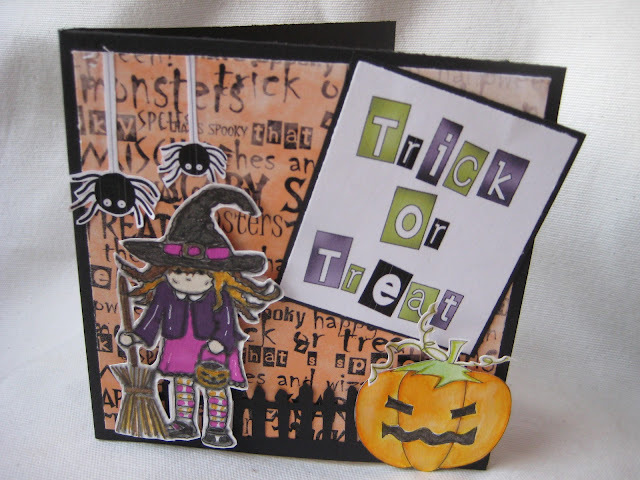 The papers are a mix of Pretty Tough and Not For Girls, as well as the Sundae of Seasons halloween images and the vines are cut with a CheeryLyn die. Ruth: I've made two spooky gift bags with papers from the Halloween download plus mummy images from Sundae of Seasons which have been attached the the star tag. And yes, those are fangs in the cello bags! So that's it - over to you! Don't forget our rules and the deadline for entries is Sunday 21 October at 12noon GMT. Good luck! 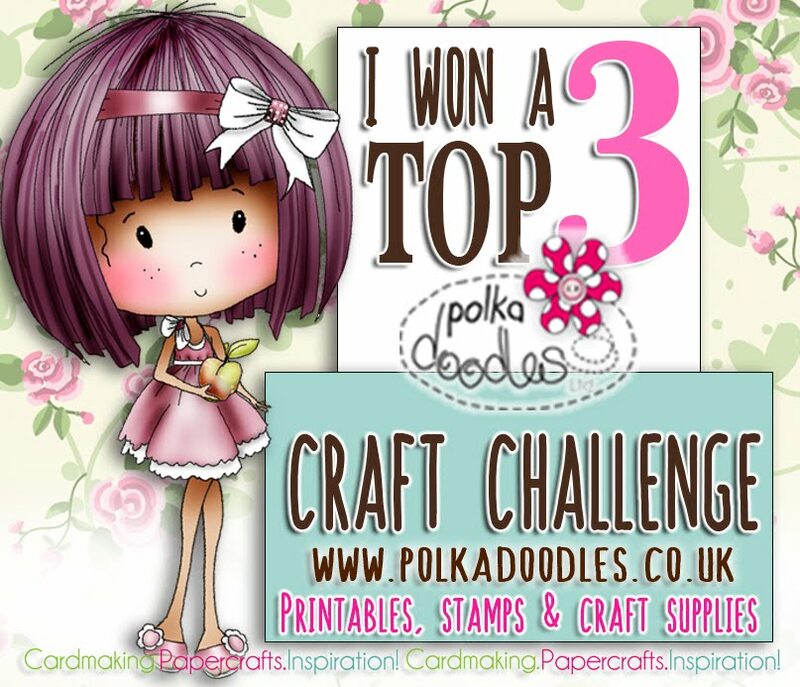 It's Friday again so it's time for another challenge here at Polka Doodles and we have some fabulous prizes for our top 3 for the challenge too so read on for all the details. 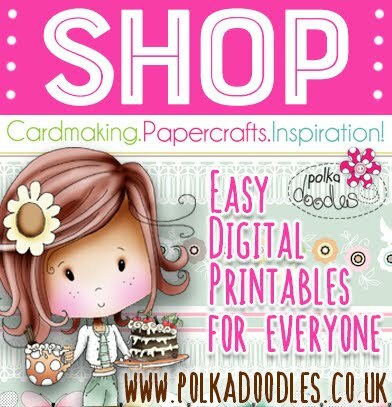 We also welcome a new Design Team member to Team B this week as we have the lovely Karen who's whipped a card up very quickly to share with you. You'll find her gorgeous creation below. 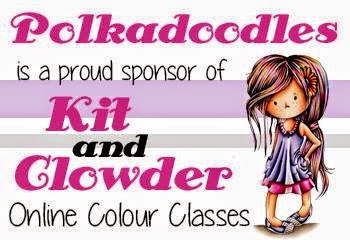 If you hop over to the Polka Doodles shop, you'll also see that Nikky has a brand new DVD out called Colour Therapy With Nikky and is all about colouring with alcohol markers. There are 7 video tutorials full of Nikky's tips on colouring hair, skin etc and it's definitely not to be missed! We can also finally reveal that we have 3 lovely talented new teamies who have joined us this week, the gorgeous Karen, Eva and Helen! So watch out for their creations and we are ultra excited to have them on board Team Doodle - welcome to you all ladies!! We'd also like to thank all those of you who did apply for the DT call, it took us a while to choose from all the fab talent but you all should have had emails back from us now and we're so sorry we had to disappoint so many of you - it's so difficult choosing :C but never give up hope and we look forward to seeing your applications next time. Thank you for giving up your time to apply, we really appreciate it. For this challenge we're very excited to be able to tell you that our Nikky has a copy of the fabulousness that is the Here Comes Christmas CD for each of the top 3 winners - how fantastic is that!!! Don't forget to follow our rules which are below! Congratulations to you all! Laurie, please email Nikky for your prize and you can all grab your blinkies from the sidebar. Please remember to put your verification code and the challenge week in the subject field on your email. For all prize winners, you must use the code given above to claim your prize otherwise we cannot release it. As you'll see from the Design Team's inspiration below, the challenge theme could mean butterflies, birds, angels, fairies and so on. With such fabulous prizes on offer this week, who could resist the challenge! 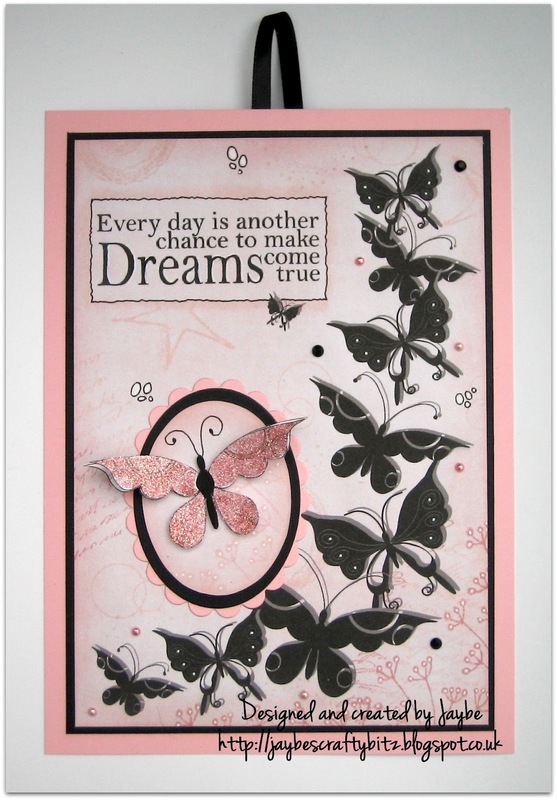 JAN: I'm so excited to have chosen this week's theme for the challenge and anyone who knows me knows how I love butterflies, which fit the theme perfectly! I decided to make a wall hanging using pretty pink paper, the gorgeous black butterfly silhouettes and a lovely sentiment from the Candy Doodles CD. 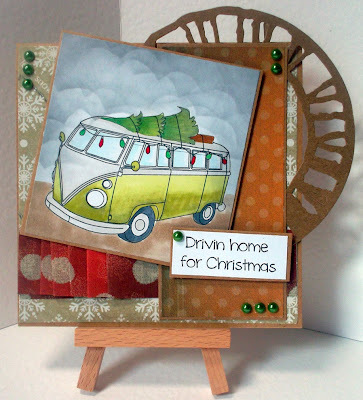 See my blog for further details on how I created this project using the CD. 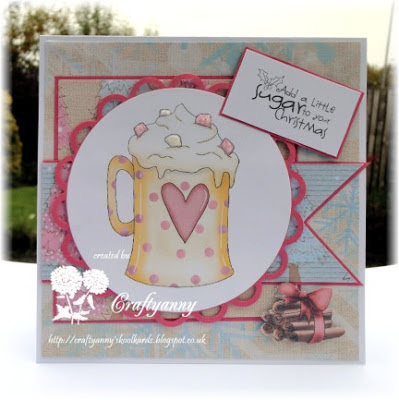 Claire - I've used the Sugarplum Daisy CD and the Candy Doodles Collectors Edition to create my tag/pocket card. 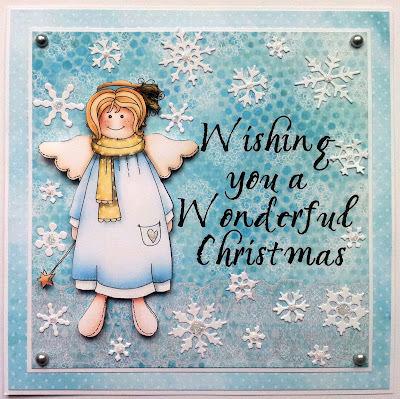 Fliss - I've still got Christmas coming out all over so my card for today was made with the gorgeousness that is the Studio 12 Picknix Collection 2 - Gingerbread Twist and I've gone for loads of texture with dry and heat embossing, scrunching, inking and edge distressing. My needle and thread also came out to make the ruched border. A touch of glitter added for some glamour too. 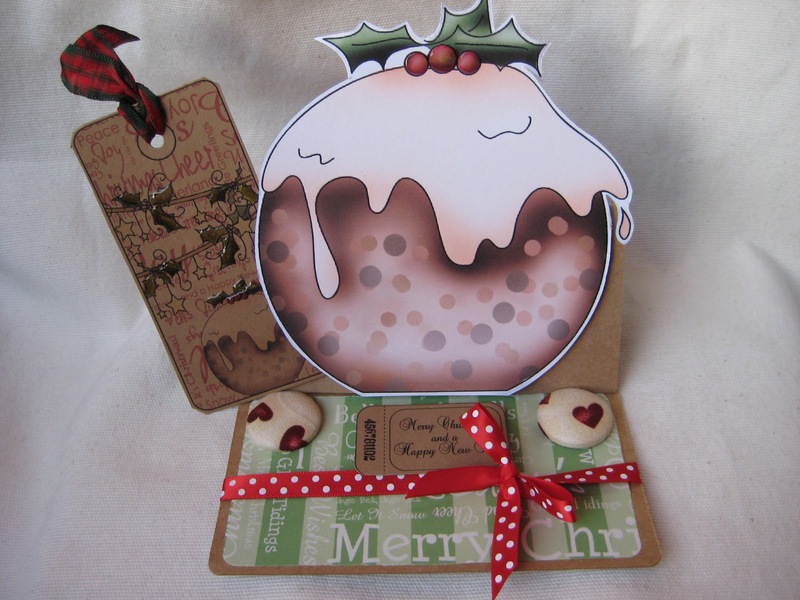 Kitty - I have created another Christmas card, i just love all the Christmas ranges this year. 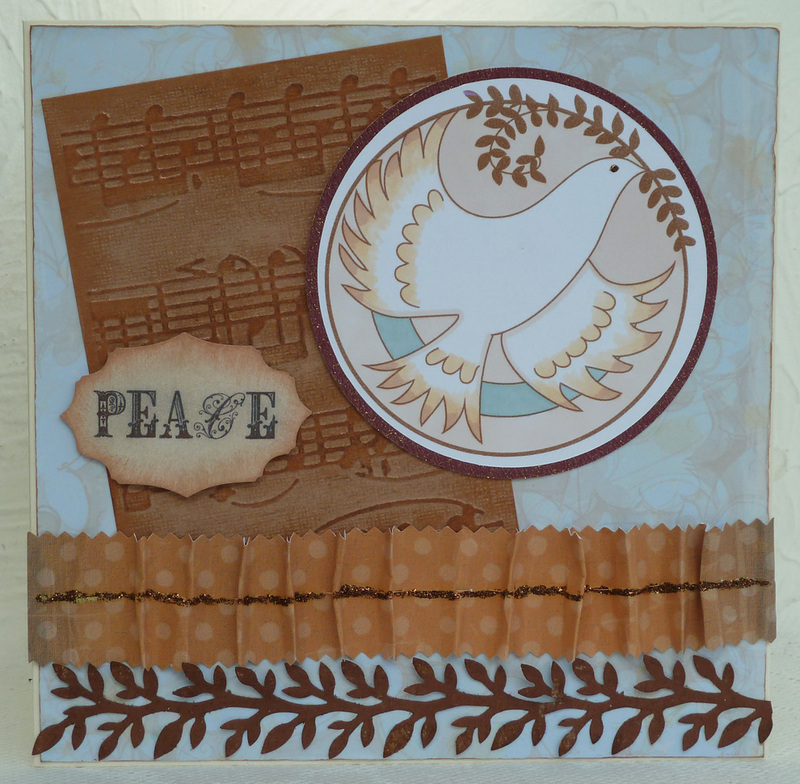 I have used the Gingerbread Twist CD for all the elements on my card. I simply added some Cheery Lynn Snowflakes & some Glamour Dust. NJ I wanted to make a different shaped card for a change. I wanted it to be 3d. I have used the Sundae of Seasons for this. I love butterflies! Shell-For my card this week I wanted to do something a bit different, normally for this theme I'd do an angel or butterflies so I have used bats...this little fella is from the Sundae of Seasons cd and so are the sentiment and the bats. Fabi- For my project I have created a very fun card, and one of my favorites: Easel Card. I have used an image from the Here comes Christmas CD Rom, and the papers are from the same CD. Karen - This cute image is from the Sundae of Seasons CD and I coloured her with ProMarkers. For the doily I used a Cheery Lynn die, pearls and ribbon are from my stash. Fabulous inspiration and we can't wait to see your creations. You have until 12 noon on Sunday 14 October to enter and please don't forget our rules.